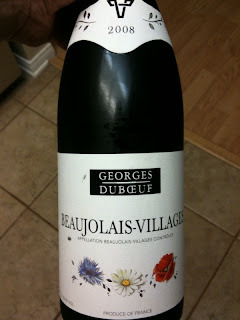 It's warm and summery, traditionally white wine weather but ya know there are just some times I get in the mood for a reds (actually in the grand scheme of things I am much more of red wine guy) so last night I opened a bottle of Georges Duboeuf Beaujolais Villages 2008. Beaujolais is a terribly misunderstood appellation of France because what the majority of wine drinkers know of Beaujolais is the fun, fruity must-be-consumed-immediately "nouveau" that comes out just in time for Thanksgiving (and makes a good pairing for traditional "turkey day" meals). Beaujolais is much, much more than that. Usually grouped in as part of Burgundy but apart from some blurring with the Maconnais area there isn't much they have in common. Beaujolais is dedicated to the Gamay grape and while the traditional production method is for "red fruit", smooth, kinda "happy" wines there is wide variation in wines that are from this region. Beaujolais, accounting for about half of the wine sold. This is the basic AOC. Usually drink within a year of production. Beaujolais Villages, an intermediate level designation which includes wine from any one or more of 39 designated villages. Can hold its appeal for a two or three years. Cru Beaujolais, the highest category of classification in Beaujolais, account for the production within ten villages. These wines do not usually show the word "Beaujolais" on the label and hold well for several years and each of the ten productions have their own characteristics that make them distinct from the others in this group. In the glass this wine appears clear, medium (-) intensity bright cherry color. The nose is clean, lightly fragrant with wild flowers and red berries leading the way and just the slight undertone of what I initially got as orange peel. The wine is dry, light bodied, medium acidity, low smooth tannins and having a flavor profile of red berries and just the tiniest hint of spice on its medium length finish. This is a refreshing red wine, meant to be served chilled like a white and a lovely little red wine summer companion.